Joy Caluag, a financial assistant in McCormick’s Department of Biomedical Engineering, was named the summer STAR award winner at a staff appreciation event on July 26. The STAR award, which stands for Staff Team Appreciation and Recognition, is given quarterly to a McCormick staff member who demonstrates leadership and goes above and beyond his or her regular job duties. Staff and faculty can nominate potential award winners, and a selection committee recommends a finalist to the dean for selection. 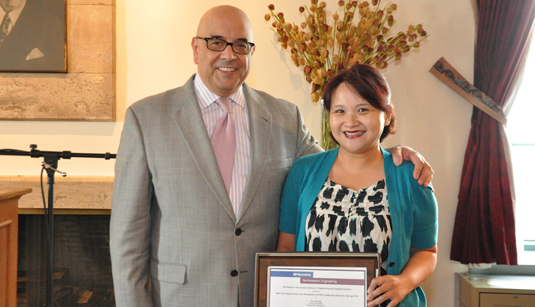 Caluag, who joined McCormick last year, was recognized for her exceptional conduct and initiative in training new staff members, as well as her financial expertise, efficiency, and patients with students and faculty. "Your willingness to train your peers and serve as an essential resource makes you an extraordinary asset," her award states. "You have emerged as a recognized authority in McCormick."